The IoT European Platforms Initiative (IoT-EPI) projects are addressing the topic of Internet of Things and Platforms for Connected Smart Objects and aim to deliver an IoT extended into a web of platforms for connected devices and objects that supports smart environments, businesses, services and persons with dynamic and adaptive configuration capabilities. The specific areas of focus of the research activities are architectures and semantic interoperability, which reliably cover multiple use cases. The goal is to deliver dynamically-configured infrastructure and integration platforms for connected smart objects covering multiple technologies and multiple intelligent artefacts. The IoT-EPI ecosystem has been created with the objective of increasing the impact of the IoT-related European research and innovation, including seven European promising projects on IoT platforms: TagItSmart!, symbIoTe, Inter-IoT, bIoTope, BIG IoT, Agile and Vicinity. This white paper provides an insight regarding interoperability in the IoT platforms and ecosystems created and used by IoT-EPI. 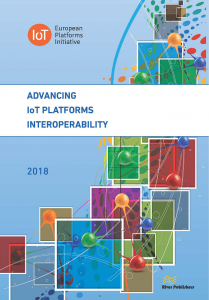 The scope of this document covers the interoperability aspects, challenges and approaches that cope with interoperability in the current existing IoT platforms and presents some insights regarding the future of interoperability in this context. It presents possible solutions, and a possible IoT interoperability platform architecture.